Confession: Our family hardly ever eats fish. I cook it once every few years or so and that’s about it. There are a few reasons for this. First, Nate does not like fish, which is shocking since he comes from a long line of seafood-loving New Englanders. The second reason is I just don’t know the best ways to prepare seafood since I never do it. Practice makes perfect and there just isn’t any practice going on in my kitchen! 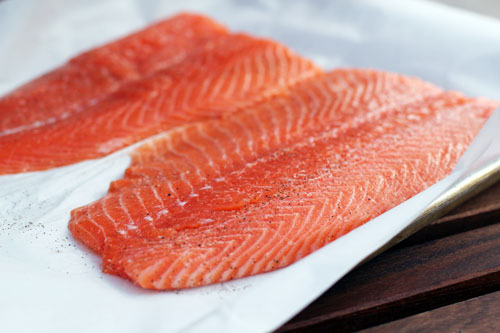 The Salmon Council reached out to me recently about doing a salmon recipe in support of American Heart Month (which is right now!) and I thought it would be a good opportunity to get some fish going on in our house. 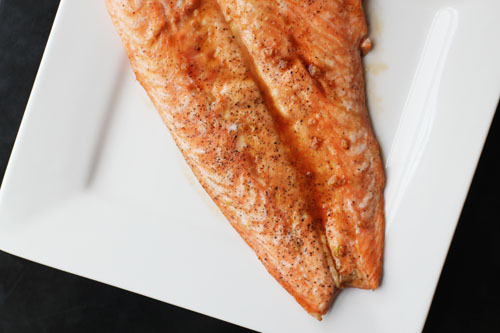 The American Heart Association (AHA) recommends eating fish because it’s a good source of protein and high in omega-3 fatty acids. 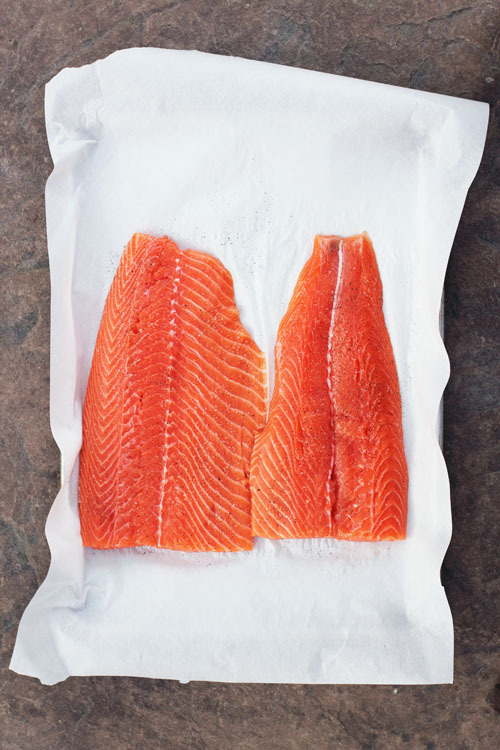 Salmon is at the top of their fish list and the AHA recommends eating two servings of heart-healthy fish TWICE A WEEK, which can reduce your risk of dying from a heart attack by up to one-third. I guess my twice a decade isn’t quite up to snuff! 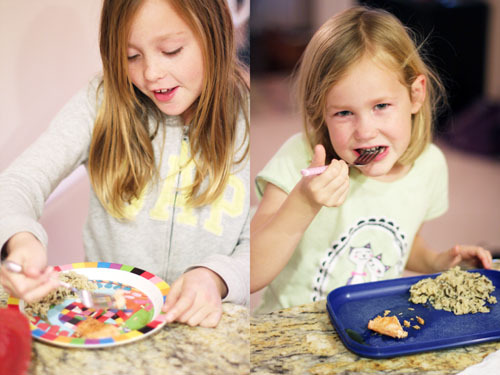 I decided it would be fun to throw together a simple and delicious salmon recipe, in the hopes that my kids would go for it. As I was making dinner last night, Cate walked in and asked what we were having. 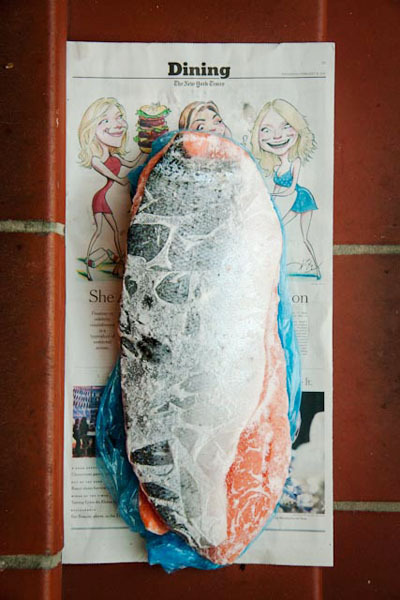 I told her salmon, to which she replied, “I don’t like fish.” I asked her, “Well, what fish have you had?” She didn’t have an answer, so she said she would give it a try and as soon as the salmon came out of the oven, she asked for a bite. She was immediately converted. In fact she had three servings for dinner and exclaimed that it was “AWESOME.” She also said that the “salmon people” would be happy with my blog post because I could tell everyone kids love it. It was super, duper, crazy cute. She also asked if we can have salmon more often. Success! Anna wasn’t quite as enthusiastic, but she did like dinner and cleared her plate no problem! Nate is still on the fence – he said the recipe is good, but…you know, fish. But he promised he would never voice those opinions out loud in front of the kids since they like are really liking fish and it’s so healthy! This recipe is so incredibly simple it’s surprising. 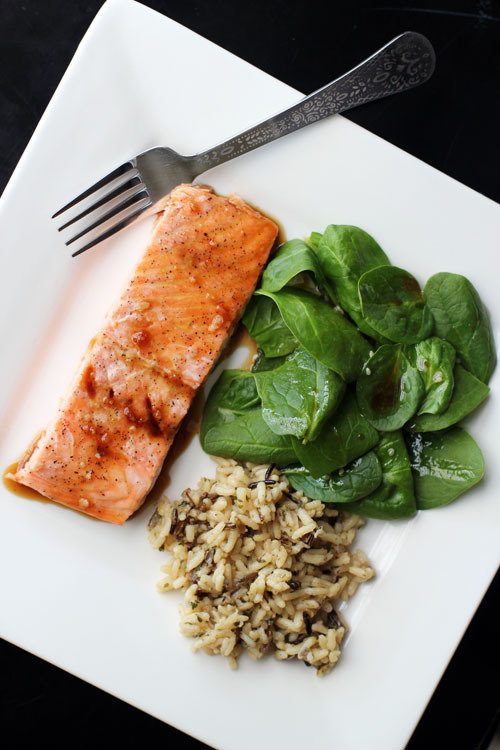 Even if you’ve never cooked fish before you’ll have success! The leftovers were pretty good, but honestly, when the salmon is fresh out of the oven it is IRRESISTIBLE. So flavorful and moist with great texture, Cate and I were swooning! Also, Cate told me I should take a picture of she and Anna enjoying their salmon. I obliged. How could I not? Leave a comment on this post – any comment! Easy peasy! The giveaway winner was comment #77, Natahsa P. Congratulations, Natasha! 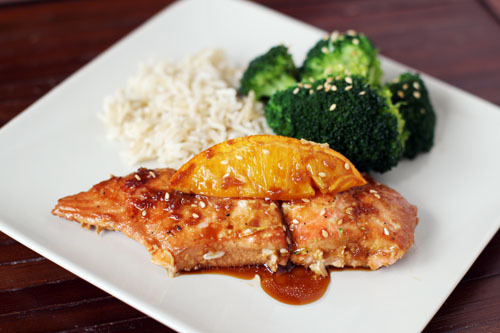 Without further ado, the super easy, even more scrumptious recipe for Maple Soy Glazed Salmon! Preheat medium skillet over medium heat with 2 T of oil. Add onions, garlic, red pepper flakes, cumin, salt and pepper. Cook, stirring occasionally, for 3 mins. While the onions are cooking, preheat a medium non-stick skillet over medium-high heat with the remaining 2 T oil. 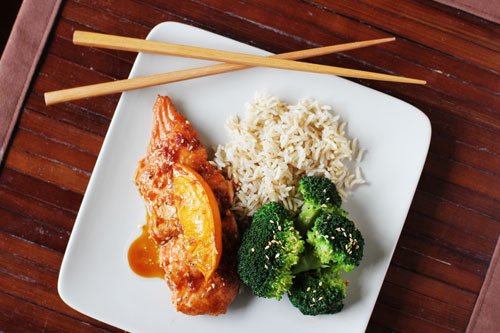 In a shallow dish, combine the juice of 1 lime, honey, chili powder, salt and pepper. 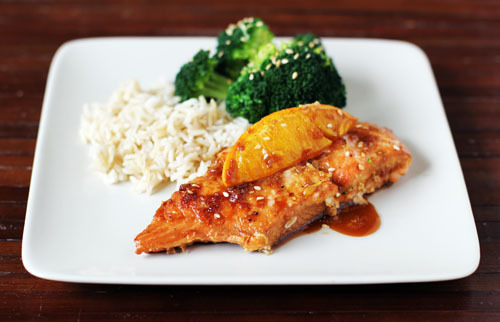 Add the salmon fillets to the lime-honey mixture and toss to coat thoroughly. 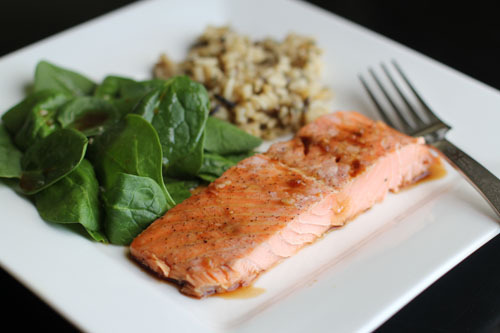 Add the seasoned salmon to the hot skillet and cook until just cooked through, 3-4 mins on each side. To the make salad, add the bell peppers and corn kernels to the onion mixture and cook for 1 min. Add the chicken stock and continue to cook for another 2 minutes. Add the black beans and cook until the beans are just heated through. Remove the skillet from the heat and add the juice of the second lime, the cilantro and spinach. Toss to wilt the spinach and then taste and adjust the seasoning. 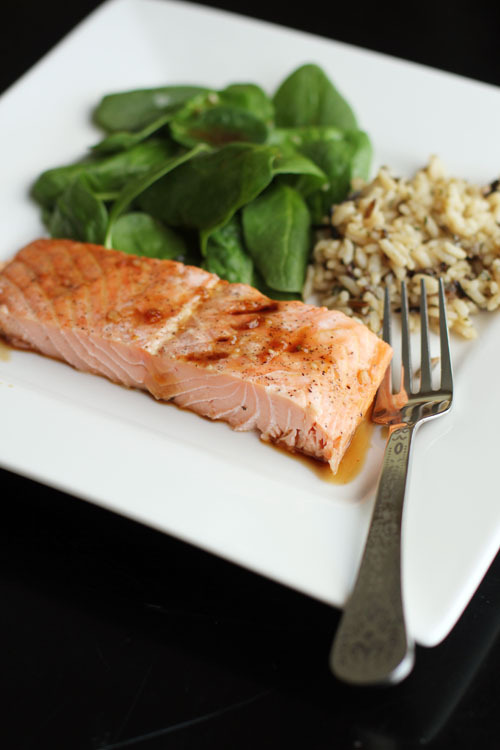 Serve the salmon on the warm salad.